Quarter-length studio portrait of a woman in Ho-Chunk regalia wrapped in a blanket, with a child on her back. The child is wearing a fur hat, and they are posing sitting in front of a painted backdrop. Clara Kingsley (Big) Blackhawk (KeesKawWinKah) carries her son Andrew John (Big) Blackhawk (WaConChaHoNoKah) on her back. 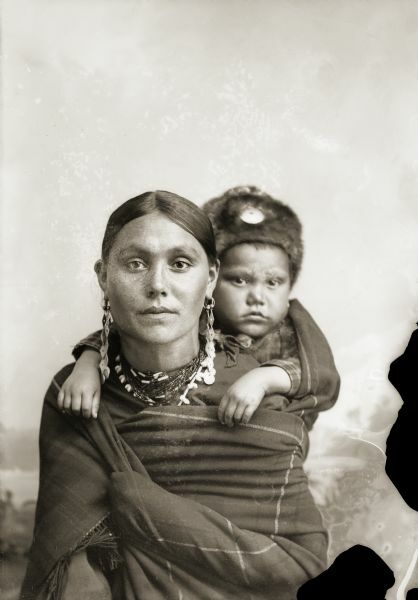 Using a shawl as a back sling was a common way to carry infants in this period. See also Image ID: 2333 for scan from vintage print. This image was used in People of the Big Voice, published by Wisconsin Historical Society Press (2011). The image appeared in the March section of the 1981 Wisconsin Historical Calendar.